I ♥ WordPress! It’s a fantastic Open source blogging and content management system. There’s a great community of people behind the design & development of the WordPress system itself as well a huge number of designers & developers who share their knowledge through blog posts, tutorials and the creation of thousands of themes & plugins. When I was first starting with WordPress though, I was disappointed that there was no user manual or simple guide to get me started. True, there are heaps of articles within the WordPress Codex that go into great detail about all sorts of topics and this is great if you want to get really involved in developing your own WordPress theme or creating plugins, but it can be a bit daunting for those users who just want a simple guide to using the Content Management side of WordPress. A quick look through the online documentation on the WordPress site can have you scratching your head within minutes as to what to read first. When you create custom designed sites for your clients, it’s not always possible to physically go to a their location to provide them with hands-on training. So, rather than simply sending people a bunch of different links in the hope that they’d use them to learn WordPress themselves, I decided to write an easy to follow manual that I could provide them. My aim for the Easy WP Guide was to write something that was easy to read and that covered the basics in regards to editing & updating your site content. You’ll find that some topics within the guide are only touched upon lightly. My intent wasn’t to cover setting up your WordPress site or editing theme files, there’s plenty of information on those topics within the WordPress Codex and on the web. I’ve created the site so that I can share my documentation with anyone who may be in the same situation. The documentation is available as a PDF and a Word document on the download page. Feel free to rebrand the Word doc and pass on to your clients if you find it useful. Alternatively, send them to the Easy WP Guide site where they can read the documentation online. The site itself was designed and developed by yours truly. It was developed using HTML5 & CSS3 and of course, it also runs on the power of WordPress. Font replacement is courtesy of Font Squirrel, an awesome resource for 100% free for commercial use fonts. I’m using PT Sans for all the main site copy and menus and Journal for all the headings. I also made use of the awesome HTML5 Boilerplate. HTML5 Boilerplate gives you the best of the best practices: cross-browser normalization, performance optimizations, even optional features like cross-domain Ajax and Flash. A starter apache .htaccess config file sets you up with caching rules and preps your site to serve HTML5 video, use @font-face and gzip. It’s cross-browser compatible, HTML5 ready, provides iOS, Android, Opera Mobile-adaptable markup and a CSS skeleton as well as .clearfix and .visuallyhidden classes to style things wisely and accessibly. If you’re thinking of getting into some HTML5 development, I suggest you do yourself a favour and check it out. 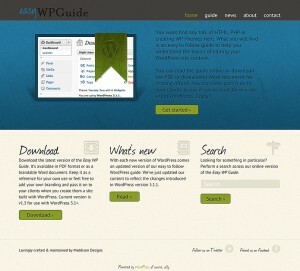 I hope that you find the Easy WP Guide useful, either for yourself or for passing onto your clients. If you feel that something is missing, incorrect or not covered adequately, drop me an email and I’ll look into it. I’d love to hear if you think you’ll be able to get use out of it, so leave a comment below. Thanks. I just came across your Easy WP Guide – it’s fantastic. I’m definitely going to be recommending it to my clients. Let me know if you’d like any help updating it for future versions of WordPress.